Robert, James and Henry Coey / Cowie were three brothers who all chose the railways in Ireland as their career path, and who all got top positions: Robert in Dublin on the Great Southern & Western Railway with Maunsell as his Works Manager, and James and Henry in Belfast with the Belfast & Northern Counties Railway as it prepared for take-over by the Midland Railway. 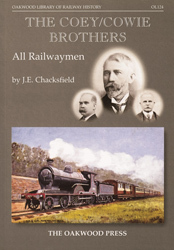 The stories cover their involvement in important developments in engineering and management techniques at a time when the railway reigned supreme as the prime transport medium. The Span of their careers also covers a time of great change in Irish history, as that land struggled for its own identity and political voice. The one notable event linking the two themes of the book, engineering in the south and management in the north, was the birth and brief career of the Titanic. James and Henry watched the building of this vessel and Robert’s locomotives and stock took several hundred of the passengers to Cobh for their last fateful voyage. It is hoped that this book will enable the readers to understand the expertise that undoubtedly sprang from the competent brothers which eventually passed to other under them. Many of those so influenced were to go across to England and ply their trades on railways there to good effect. As with all biographies, access to family data helps in the formation of a more complete assessment of the subjects. Such information was unearthed in written and pictorial form and has been used to good effect in building a picture of the three brothers’ careers. The interweaving of events over the late 19th to early 20th centuries with the railway developments attributed to the brothers shows how politics can interfere with the smooth running and development of transport services so vital to a land’s economy. This, then, tells the story of three exceptional men who played such an important part in the Irish railway scenario. A5 format, 176 pages, more than 150 illustrations.